Keeping bikes out of the landfill. We are volunteer only, and here to help you! Comments Off on Our last day open for the 2016 Season is October 27th, 2016! Our last day open for the 2016 Season is October 27th, 2016! Join us in celebrating a successful season with food, drink, music and fire as we close our doors for the year. Laura Karels of Bee Balm Fields will be playing music at 6pm and we will have a volunteer awards ceremony at 7pm. This event is open to everyone in the community, as well as our volunteers and members. Have no fear, although the shop will be closed until April, Key City Bike will be continuing through the winter with Chilly Willy Friday night rides and more! Comments Off on Donate online to your favorite little do-it-yourself-shop-that-could with PayPal! Donate online to your favorite little do-it-yourself-shop-that-could with PayPal! Take a gander at this fancy new PayPal link. As a 501(c)(3) organization your donations are tax deductible. Please note in the special instructions if you need a donation slip for tax purposes. Join us on Sunday, June 26, 2016 from 10:00am-11:00am for the second of our monthly maintenance classes. Flat tire on the trail? Don’t call mom for a ride, you can fix it yourself! In this session learn how to find out why your tire went flat and how to repair it. Everyone who attends this class will receive their very own tire lever, an essential tool for tire/tube changes. Open to everyone!This is a free class! Donations welcome! Comments Off on BIKE DRIVE! Flying Penguin Outdoor Sports is hosting a bike drive for Key City Bike on Saturday, June 4, 2016 from 10:00am – 2:00pm. Bring your unused bikes to 624 N Victory Dr in Mankato and check out Jon Andersen’s bike/ski shop while there. Pepe the dog would enjoy a ear scritch, too! 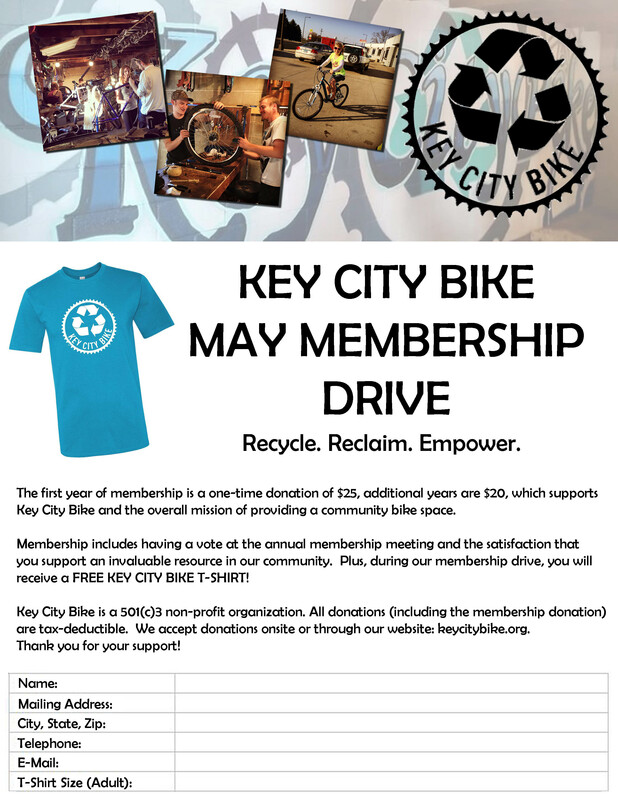 The Key City Bike May Membership Drive has begun! 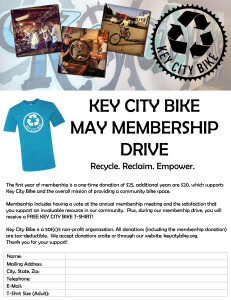 Please consider supporting the mission of Key City Bike by becoming a member. All 2016 members will receive a FREE Key City Bike T-shirt available for pick up at Key City Bike in Mankato or Chrome Industries in Minneapolis for our metro friends at the end of May. All the details are in the image below, click to enlarge. You can stop by the shop to make your membership donation or donate online by selecting the “Donate” button at the bottom of the page. If you use the online method, please include a note stating you are signing up as a member and your requested t-shirt size. Comments Off on Key City Bike has an online calendar. 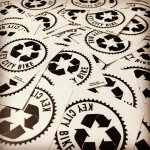 Key City Bike has an online calendar. Check back as events and activities will be added – especially in May – which is Mankato Bike/Walk Week. Get out and enjoy a ride on two wheels! Buying something on the interwebs? 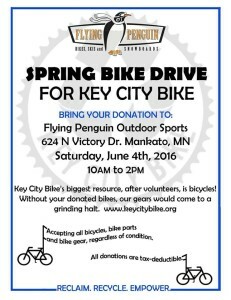 Start here and support Key City Bike! Comments Off on GEARING UP FOR THE 2016 SEASON! GEARING UP FOR THE 2016 SEASON! 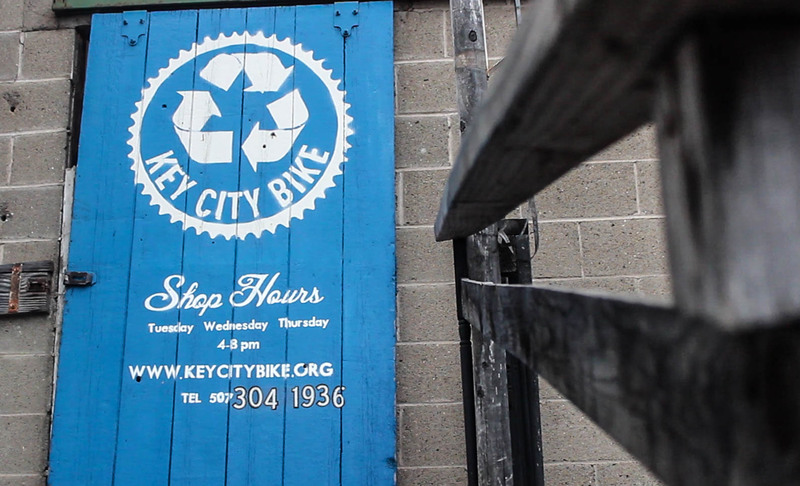 Key City Bike will be open for the 2016 Season at 4:00pm on Tuesday, April 5, 2016. 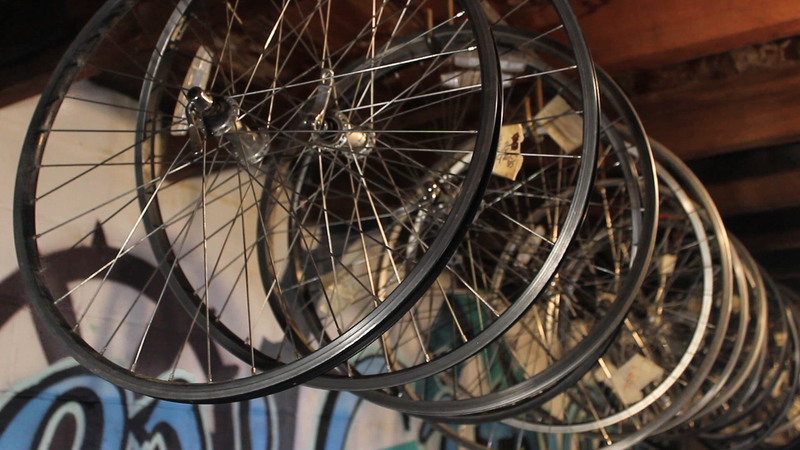 Drop off dates for the 5th Annual Wheelworks bicycle themed open entry art show at The 410 Project are Wednesday, April 20th and Thursday, April 21st from 2:00-7:00pm. Check out the WheelWorks V Facebook event for more details. Comments Off on Member Meeting & Board Elections to be held Monday, February 29 from 6-8pm at the Eagle’s Club. Member Meeting & Board Elections to be held Monday, February 29 from 6-8pm at the Eagle’s Club. 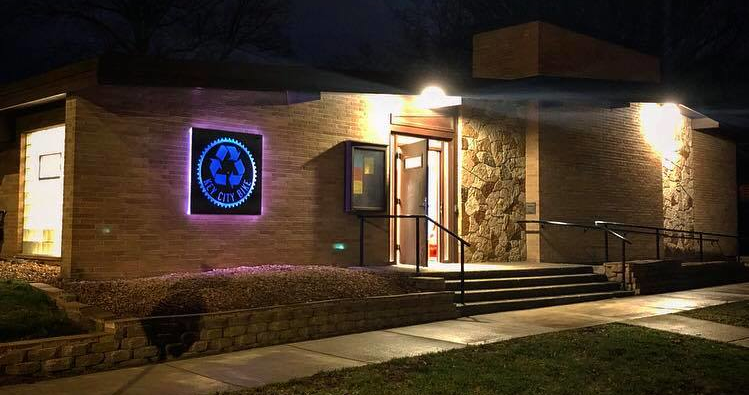 Please join us for our upcoming Member meeting and Board elections on Monday, February 29, 2016 from 6:00-8:00pm at the Eagle’s Club in Mankato. There will be tacos! Here is a link to the Facebook event, https://www.facebook.com/events/1669036100015537/. Comments Off on The Search for the Executive Director for the 2016 Season Is Underway! The Search for the Executive Director for the 2016 Season Is Underway! We are accepting applications for the Executive Director position for the 2016 season. 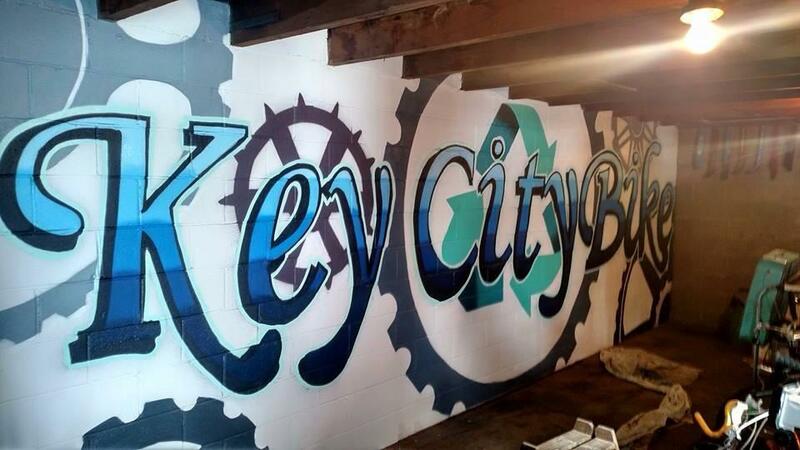 Key City Bike is open April 1st through October 31st each year. Below, and here, kcb exec dir job descrip 12-12-15, is the job description. 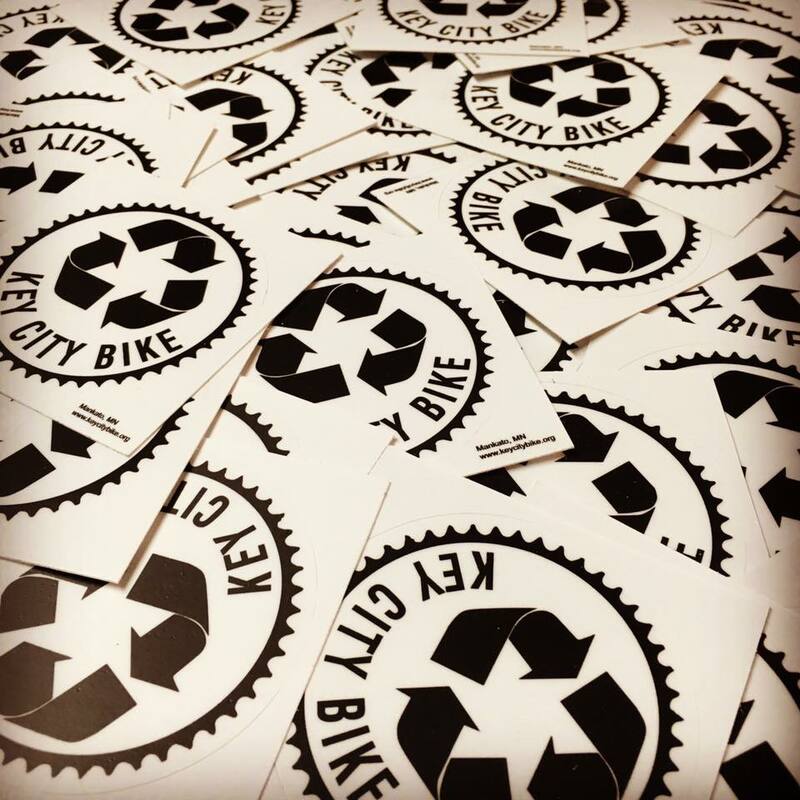 If you are interested please submit a letter of interest and a resume to Key City Bike KCBexecdirsearch2016@gmail.com before March 18, 2016. The Board of Directors will be in contact with those who express interest once we have a chance to review and finalize everything. 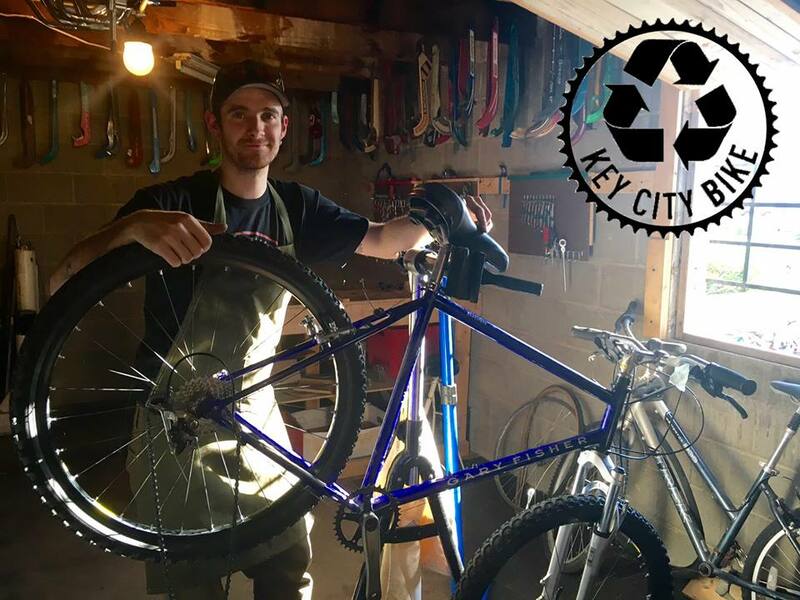 Provide overall management of the organization’s mission to keep bikes out of the landfill, get them into the hands of those that need them and teach community members how to maintain their bikes. • Schedule volunteers to open, staff and securely close the shop during open shop hours. • Organize and coordinate the sustainable use of limited shop resources. • Oversee that financial record keeping and tax filings are handled accurately and in a timely manner. • Respond to email, phone and social media inquiries. • Coordinate and manage community outreach efforts such as maintenance and repair clinics, bike drives, local events, etc. • Provide periodic reports to the Board of Directors, members and volunteers. • Personable, outgoing demeanor when dealing with volunteers and community members. • Basic knowledge of bike maintenance and repair. • Basic computer skills and social media management. 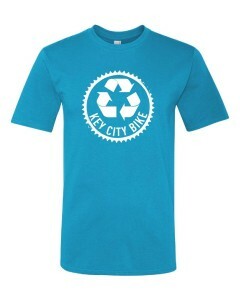 • Embrace the mission of Key City Bike. Lead volunteers, intermittent volunteers and earn-a-bike participants.